Matcha green tea cheesecake is an elegant, creamy Japanese dessert with a sweet graham cracker crumb crust. This dessert is easy to prepare. According to Japanese cuisine, this style of cheesecake is called "rare cheesecake." This doesn't have any implications that it is raw or undercooked, but simply that it isn't baked. Instead, the ingredients are mixed with gelatin and chilled in the refrigerator to set. The beauty of this Japanese style matcha cheesecake is that it offers creative presentation options because it is not baked. While the recipe below suggests the use of a single cake pan, the dessert can also be prepared in beautiful individual glasses, bowls, or ramekins. In a small bowl, combine unflavored gelatin powder and 1/4 cup water. Mix and set aside. To prepare the crust, in a separate bowl, combine graham cracker crumbs, melted butter, and sugar. Spread the crumb mixture in the bottom of an 8 inch round cake pan. Flatten the crumbs by pressing them with the back of a spoon to create a solid crust. Chill the crust in the refrigerator while the filling is prepared. In a small bowl combine matcha green tea powder with 3 tablespoons warm water to dissolve the powder completely. Set aside. In a large bowl, mix softened cream cheese and sugar together. Use a mixer for the best results. Add plain yogurt and heavy cream to the cream cheese mixture and mix until smooth. Next, add the matcha green tea liquid to the cheesecake mixture and mix until incorporated. The filling will become a light green color. Heat the gelatin mixture (it will have solidified) in the microwave until it becomes liquid and add it to the cheesecake filling. Stir well. Pour the filling on top of the crust and spread evenly. Refrigerate the cheesecake for 6 hours, or until set. Add seasonal berries or freshly whipped cream as a garnish for the matcha green tea cheesecake. 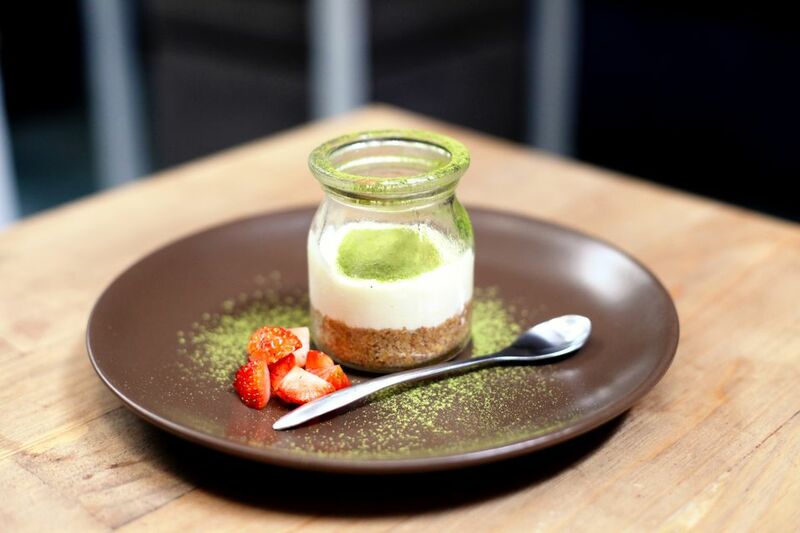 Dust the cheesecake with matcha powder to garnish it just prior to serving.